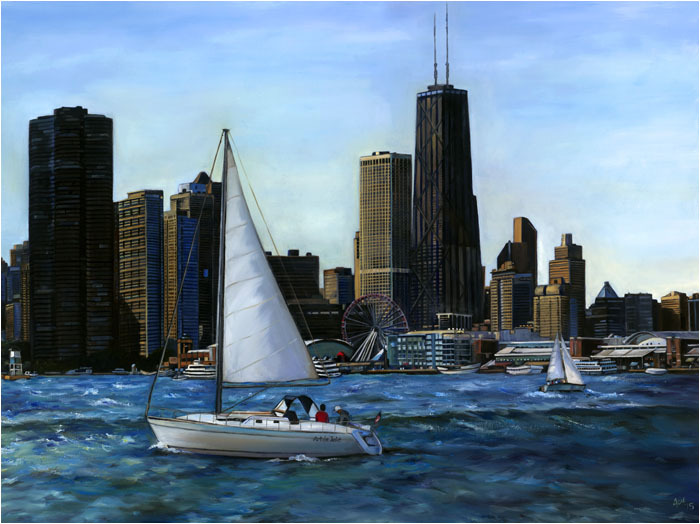 This huge Chicago skyline painting depicts the beautiful Summer lakefront from the vantage point of a boat looking back toward Navy Pier. It features a portrait of Lake Point Tower (to the left) and the John Hancock buidling. Taking a boat cruise of Lake Michigan is a must do activity for any visiting tourist us locals enjoy as well. Many of the larger cruising vessels docked at Navy Pier offer dinner, cocktails, and dancing while it's also a real treat to be invited to sail on one of the private boats docked a bit further south at the Chicago Yacht Club.